Macquarie Private Wealth's well-regarded resources team argue in their 2013 global market outlook that the debate over about whether commodities are headed for a hard landing as China's growth slows is meaningless. Because the boom is already over. 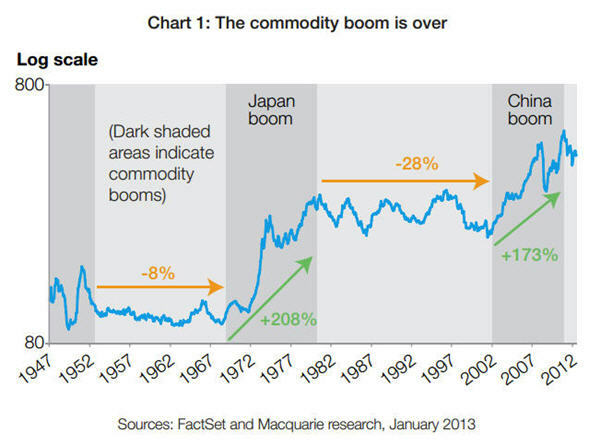 History shows commodity prices tend to trend sideways for 10–20 years, and then jump upwards in response to structural changes in the global economy, before resuming their sideways trajectory. That makes clear economic sense. An event like China’s rapid industrialization and urbanization inevitably causes a sudden price leap, as suppliers scramble to meet the upsurge in demand. Eventually, producers bring new (and sometimes more marginal) resources on line and supply begins to catch up, at which point the dramatic price increases stop. That isn’t to say the Chinese growth story is over — far from it. But those anxiously monitoring Chinese growth numbers for a sign that the boom has passed may be missing the point. China doesn’t have to slow down for commodity price rises to moderate — all that needs to happen is for supply and demand to come into balance. We reached that point in 2011. That isn’t necessarily bad news for investors. 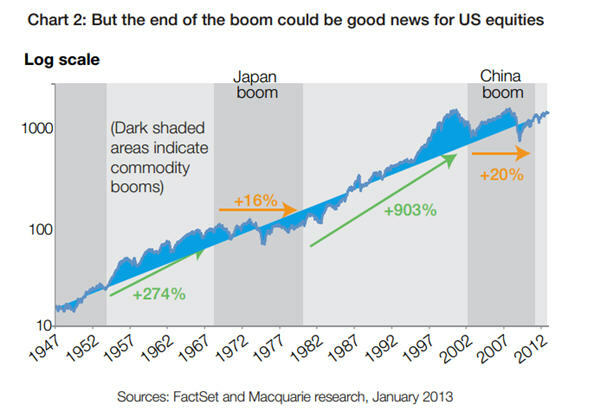 History also shows that equity markets perform better when commodity prices are trending sideways. That’s especially true of the US, but it’s also true of resource-rich economies like Australia and Canada.